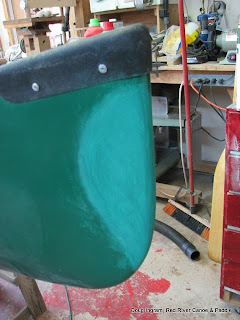 The Hellman canoe with the smashed in stem. Apparently it took several strong guys to pull it out from where it had gotten shoved in the truck. 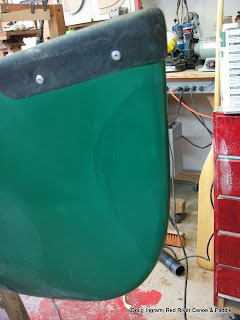 Its pretty common for canoes to get damaged in transit. First, the damaged stem material needs to be ground off. 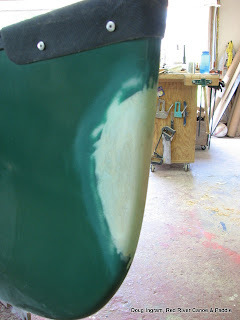 Rebuilt with fiberglass, sanded, and then painted with the same green epoxy paint that is original Hellman sent the correct paint right away and were very accessible to answer questions about using their paint correctly. All polished and ready to go. Its almost impossible to get an exact match, the paint batch can be different, the lighting, the sheen, all contribute to a slightly different look. It looks a much better match in real life than in the photo. Posted by Doug Ingram at 9:02 a.m.